Green Ox® Pallet Technology is unique. 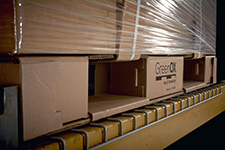 Green Ox Pallet Technology centers on a corrugated pallet that delivers cost savings through improved efficiencies in the handling, storage, and transportation of products. Green Ox Pallet Technology provides a cost-effective, viable alternative to wood and plastic pallets. And, unlike traditional pallets, our technology allows companies to achieve savings while reducing their environmental footprint. Our feature-rich technology delivers multiple benefits from performance to safety to sustainability, resulting in a positive financial impact across the entire supply chain after implementation. 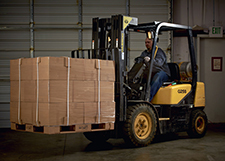 (1) Recommended load weights are evaluated on a case-by-case-basis based on load weight/distribution, load configuration, shipment type, unitization, and pallet use.